Bristol was built on trade. In 1154, it became one of the first English towns to obtain special trading privileges, being freed from the paying of all tolls and customs throughout England, Normandy and Wales. The map below shows trading activity around 1200. 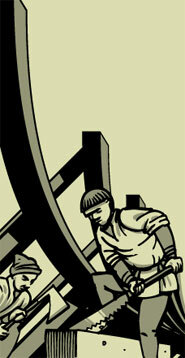 Bristol was then dealing in fish, wine, cloth, hides, tin, timber, corn, wool, madder (a dye) and silk. At this time all the important craft industries in the town had their own guilds to protect the interests of both the workers – by ensuring reasonable working conditions – and the consumers – by ensuring good workmanship. Bristol trade links c 1200. By the fifteenth century, many of Bristol's merchants had become wealthy and influential figures, replacing the old barons in controlling the life of the city. They invested part of their fortunes in speculative ventures to find new markets. The map below shows Bristol's trading links around 1500, which had reached to the Mediterranean and further eastwards. Bristol trade links c 1500. Between 1500 and 1750, Bristol merchants became increasingly involved in voyages of discovery – looking for alternate routes to the treasures of the Indies and Far East – and in colonial endeavours across the Atlantic in what was then called the New World. This activity helped make Bristol one of the richest cities in England. In 1701, Bristol owned a fleet of 165 merchant ships, and weaving, ship-building, sugar-refining, and the manufacture of soap, tobacco and other trading goods were flourishing in the city. 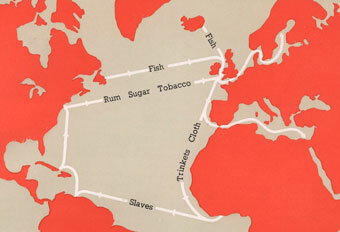 The map below shows the trade routes which were the basis of much of the city's wealth by the mid-eighteenth century. In addition to the traditional trade in dried fish from Newfoundland and Iceland, there was the infamous triangular trade between Bristol, Africa, and the Caribbean and American colonies. Trinkets, cloth and other goods were traded for enslaved African people who were traded in turn for rum, sugar and tobacco. Read more about the Transatlantic Slave Trade on the Small Island Read website. Bristol trade links c 1750. Bristol went into decline as a trading port in the nineteenth century – mainly because its facilities were too small for the bigger cargo ships that were then being used – but it enjoyed a period of recovery in the early twentieth century. 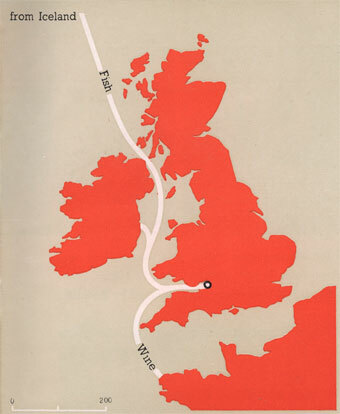 The map below shows the main imports that entered Britain via Bristol just before the outbreak of World War Two. 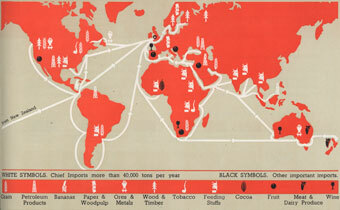 These included bananas from the West Indies – around a third of Britain's total supply – grain, petroleum products, food stuffs, paper and woodpulp, wood and timber, ores and metals, and tobacco. Very few goods were being exported from Bristol by sea at this time. 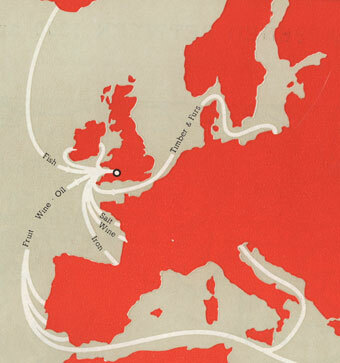 Bristol trade links c 1939. The Old City Docks ceased trading in 1977, though facilities remained at Avonmouth, Portishead and Royal Portbury. 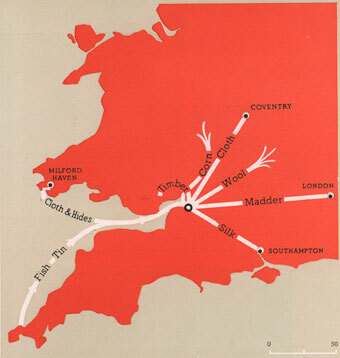 The maps in this section have been taken from the 1945 book English City: the growth and the future of Bristol by J S Fry and Sons Ltd. This is a particularly interesting publication as it was published in January of that year – while the Second World War was still being fought – but includes a large section on how Bristol could be rebuilt and reorganised once the war had ended. Follow the links to the left for information on some of the products manufactured in Bristol and other areas of business activity associated with the city, past and present. For further details of Bristol products and businesses, download the Made in Bristol section of the guide here. Tell us your memories of working at Bristol companies or using Bristol products. Make your contributions via the My Bristol page.